TechLife's May 2019 issue is out now! Here's what's inside the new mag! Get your Android device ready for anything with our ultimate guide to essential Android apps – from photo editing to security, we’ll get your phone or tablet working at peak efficiency! Plus, we review the new Samsung Galaxy S10+, take an in-depth look at smart lights, and round up the best ultra-budget smartphones in Australia. Grab your copy from newsagents, selected supermarkets or digitally via the Google Play Store or Apple Newsstand from Monday, 11th of March. Love TechLife? Sign up for the free TechRadar Australia newsletter! 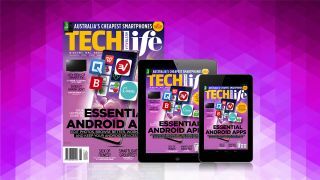 Brought to you by the same team behind TechLife magazine, the TechRadar Australia newsletter provides twice-weekly digests of the most important tech news, plus exclusives offers and discounts for Aussie readers! Got a question for the APC editorial team? You can get in touch with us by sending an email to techlife@futurenet.com.